Evolve your Digimon in the lab and train them on the farm. The latest Digimon Story: Cyber Sleuth media blast shares new details on Omnimon, new character Goro Matayoshi, new Cyberspace hackers, and the recently confirmed Digi-Lab and Digi-Farm features. 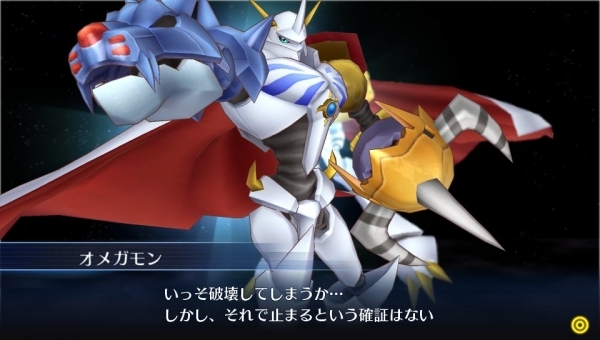 Omnimon, a Holy Knight-type Digimon and member of the Royal Knights born through the fusion of the Virus Busters WarGreymon and MetalGarurumon, via the earnest wishes of the people for goodness. It is a multi-type warrior with the characteristics with two Digimon. On its left arm, it has the shield and sword of WarGreymon, and on its right arm it has the cannon and missiles of MetalGarurumon. A veteran police inspector who refuses to retire after two years with the Police Department Cyber Crimes Investigation Unit. He has a serious obsession with “uncovering the truth” and even though he has mellowed out quite a bit over the years, he’ll use any means necessary to get to the bottom of things. His aggressive investigation methods got on the bad side of the higher ups, and he was “demoted” ahead of his retirement. He’s not well-versed on cyber-related knowledge. Since he knows Kyoko from when her dad and him were co-workers, he frequently visits her for advice. Hackers who us Digimon to commit crimes appeared in Cyberspace. The hackers team up and start various conflicts to benefit their groups. The clash between the biggest gangs “Zaxon” and “Daemons” has heated up, and they’re running wild. The protagonists scramble to get the gangs under control before cyberspace collapses. And who is the mysterious figure working behind the hacker scene? Jimmy KEN (voiced by Kouta Nemoto) – He was originally an executive of the hacker team “Zaxon,” but after deciding he wanted to do whatever he pleased, he and some other members left the group and formed the “Daemons” hacking team. Jimmy is its leader, and has a hand in various criminal acts happening in Cyberspace. Fay (voiced by Seira Ryuu) – Part of the hacker team Zaxon’s executive staff. She has vowed absolute loyalty to the team leader and will purge those who go against the command of the group. In the “Digi-Lab,” you can manage and train the Digimon you’ve obtained. You’ll have the option of “converting” Digimon, “evolving” and “devolving” Digimon, switching party member Digimon, and depositing Digimon into the Digi-Bank. You can also leave your Digimon the “Digi-Farm,” a facility players can use to automatically level-up their Digimon when they’re not tagging along on their adventure. You’ll be able to select a Digimon leader, who will give your Digimon instructions in various areas like “special training,” “development,” and “investigation.” The efficiency of their actions will change depending on the leader Digimon assigned. Through “special training,” not only will your Digimon level up, but it’s also possible their parameters will increase. Providing farm goods will allow for more efficient special training. Through “development,” they’ll be able to produce items, equipment, and farm goods. And through “investigation,” they’ll be able to better support your detective duties in discovering sub-quests and wanted hacker information. You can also feed your Digimon on the farm. By feeding them regularly, you’ll develop and deepen bonds of friendship with them.